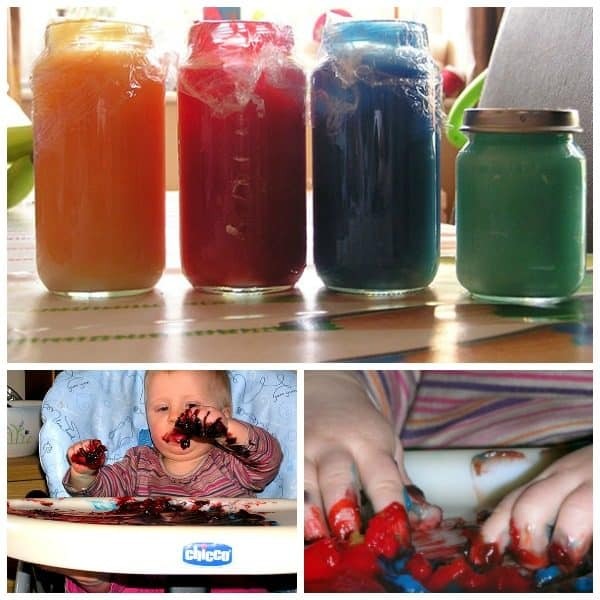 Painting with Babies and Toddlers isn’t just a visual activity or process art it’s sensory and it can start when they are young – we’ve shared before our first forays into painting with some easy edible paints and now we’re sharing our recipe for homemade paints that are taste safe so ideal for a multisensory experience for the babies and toddlers and perfect for painting with baby. The first explorations into mark marking for babies are with food – I wrote one of my first posts on Edible Finger Paints on just this – check out how you can create different colours with the edible finger paints recipes. 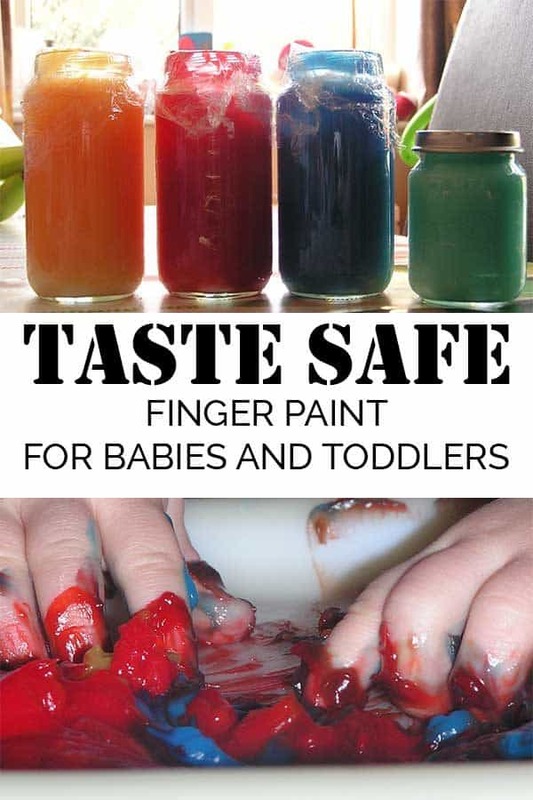 I now return to this and we have extended to use finger paints which are still non-toxic and when used with J he didn’t seem to like the taste so didn’t eat them – T is very different and actually loves the taste, but as they are none toxic and made from cooking ingredients they are safe to use with babies that are over 6 months old. We have included affiliate links to products and resources that we recommend within this activity post. Try another DIY paint recipe with our DIY Puffy Paint Recipe fun to make and paint with too. Add 1 cup of cold water to the corn flour in a bowl and mixed it together. Then using freshly boiled water I added a cup at a time to the water/corn flour mix and mixed it together. Put this mix into a saucepan over a heat and stirred it until it became a consistency of custard. Add liquid food colouring to get your desired colours. 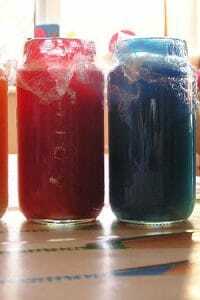 Store in a clean jar and these will last between 2 and 3 weeks. To use mix once cool and hand over to your baby and toddler to experience the sensation of painting and talk about the colours. Discover more Activities and Crafts for Babies and very young toddlers. I put some of the paints on her high chair tray and kept them separate so part of her play would be mixing the colours together which of course she did once she had had a good feel of the paints. 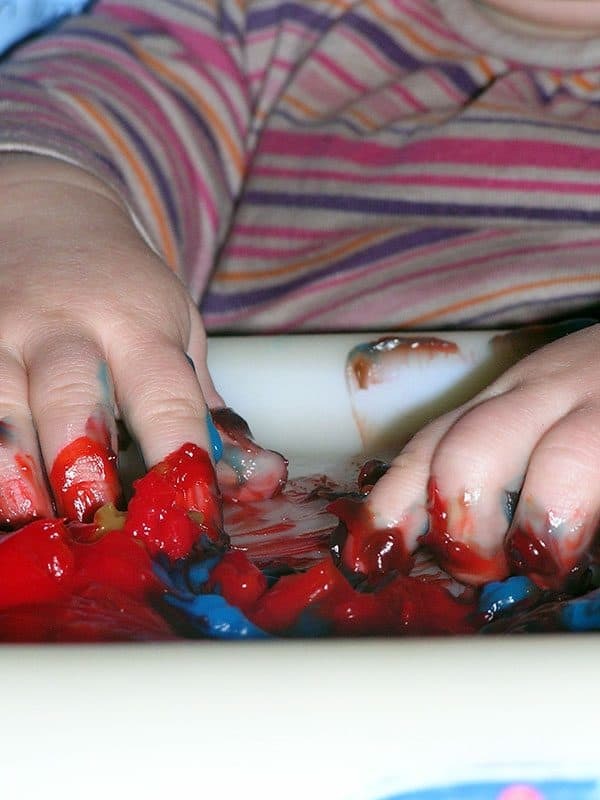 She loved the jelly like feel of the paints and enjoyed squishing them between her fingers – it was interesting as well to see her play with the different colours – she was drawn first to the red and then blue and green with yellow being the last for her to play with. 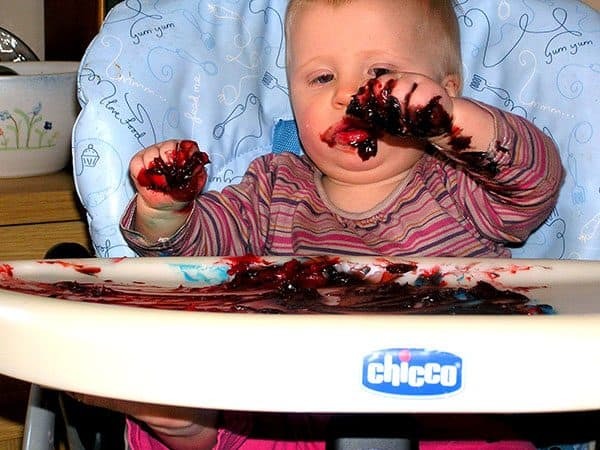 Just a warning – don’t do this with liquid food colouring if you are about to go out anywhere as although the paint was easy to clean off the high chair tray and high chair – it wasn’t so easy to clear off of T and until she had a long soak in the bath she was dyed a lovely shade of red. Use mix once cool and hand over to your baby and toddler to experience the sensation of painting and talk about the colours. See how to create a sensory art experience with your baby. Do what I say and not what we did provide your baby or toddler with a coverall – the clothes that my daughter is wearing in the pictures above NEVER recovered from the experience of painting the first time and became her “painting clothes”. A coverall like this one is ideal as it will cover the body and arms preventing clothes being stained. 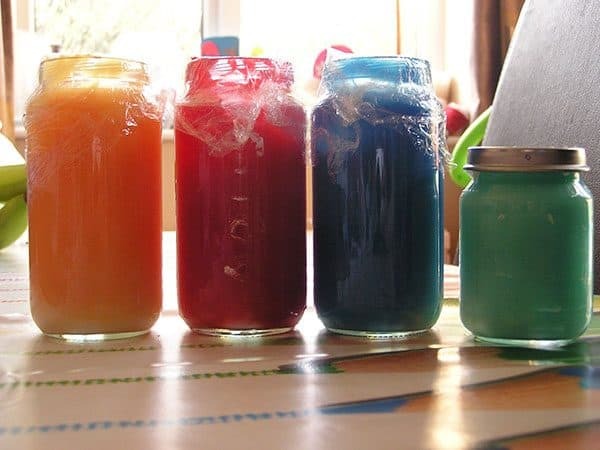 We stored our paints in a mish-mash of jars that I had left over from weaning my two – a set like these glass baby food jars are ideal for keeping your baby food in and also great for storing the paints (I even use ours now in my craft supplies to store buttons and ribbons). Protect your floor and invest in a messy mat – I was so thankful that we had these. They are still used now by my kids as a table covering when they do art and crafts on our dining room table. Fabulous! Nothing quite like a bit of fingerpainting with homemade paint! T looks like she’s having a great time Did she end up with a muddy brown colour? I find the food coloring will come out of counters if you do a mix of baking soda and lemon juice and let it sit for several minutes. I just love how you are exploring art with your baby!!! Ohhhh will have to try that Thank you for the tip. We finger painted today with sugar free cool whip and a few drops of food coloring. We didn’t have any stains but I didn’t have to add much food coloring to the cool whip to make it bright. And in the end it didn’t last as long as my lo would have liked. He started eating too much of it and not playing. But he had fun playing and he is 7 months. Did the ingredients have to used for each color or did you separate it beforee adding the foood color? Used this recipe today for play time with four babies aged between 7.5 and 8.5 months. Swapped the food colouring for fruit with strong colours. I used spinach, blackberries and dried apricot. I stewed each in a little water, puréed with a hand blender then passed through a sieve before mixing. Stored in fridge overnight and stirred before using. I did chuck afterwards as unlike food colouring will go off. Great colours, great recipe for the base mix and safe. Thanks for sharing with us, we had a great time! small position of left arm. how do I go about developing my first site and so forth. ended up being two times comparale to I might have ever before imagined!